This article about foraging for ramps is very informative, with great photos. I am on the hunt for wild ramps. I have never ate them before and cannot wait to try them. Help me find a patch! Allium tricoccum, called sometimes wild leeks, spring onions, wood leeks, or ramson, but most commonly known as the ramp or Ramps, are one of the most sought after wild foods. Recently “discovered” by the gourmet world, Martha Stewart, the New York Times, the Food Network, and more have just learned what foragers and people of the Appalachian mountains have known for generations. . .that Ramps are the delicacy of the onion family! 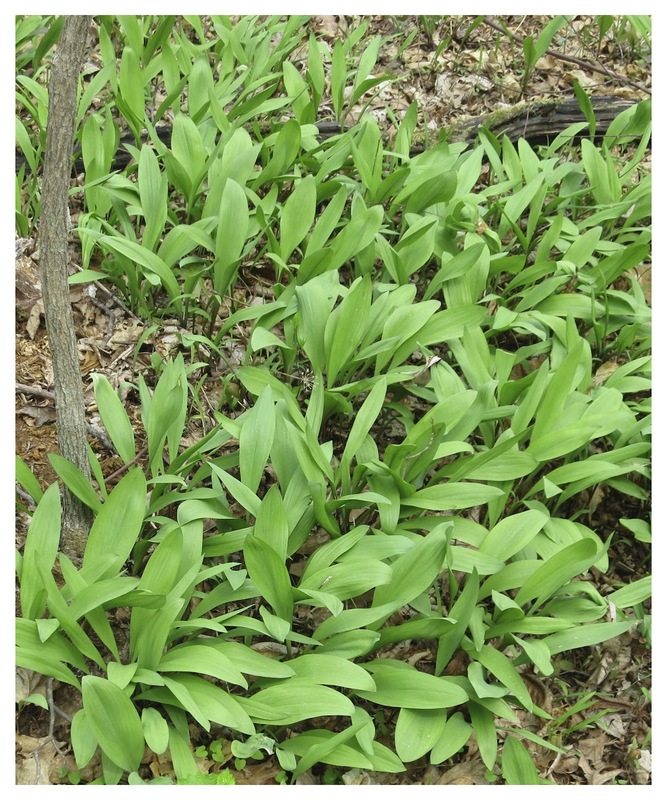 Ramps are actually very easy to ID, and, in the Northeast of the US, or mountainous regions anywhere in the East, they are pretty easy to find. Instead of going to Whole Foods or another high-end market, and paying up to $14.99 a pound for wilted specimens trucked across the continent, try taking a walk through any shady hardwood forest. Ramps like rich, moist soil, and thus are frequently found in shady patches in low-lying areas. Avoid marshes or swamps, as they cannot grow in standing water. Some guides say ramps like sandy soil, but personally, I have never found them there, so I guess it must be regional. I have found ramps in CT, VT, NJ and NY. Ramps are only found for a brief while in the Spring. In the Northeast, there time is usually between mid-April and mid-May, though with the warm weather we have had for the last few years, the season seems to have moved up at least a week. Once the trees fully leaf out, ramps are frequently cut off from the sun and their leaves die. They need to gather enough energy to store in their bulb to seed and sustain themselves throughout the winter. Important identification tip: thin, translucent leaves. According to the USDA, ramps are listed as “special concern, commercially exploited”. In Quebec commercial harvesting is illegal, and personal harvesting is limited, but there are still commercial ramp “poachers”. Many states in the United States are noticing a deterioration of local ramp populations, mostly due to commercial harvesting, and “Ramp festivals”. Some of these festivals attract as many as 35,000 tourists to small Appalachian towns. Ramp plants take 7 years to reach maturity where they can produce seeds. However, they can reproduce via rhizomes (part of the roots) or from the bulbs splitting into two. 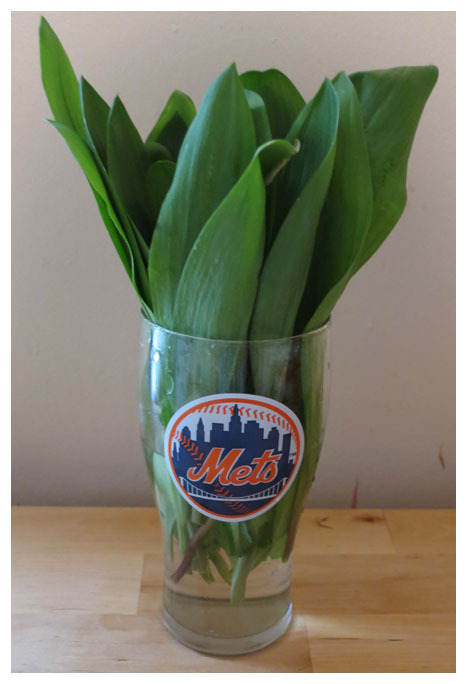 As a result, the most sustainable way to harvest them is to never take the bulb! The leaves are just as flavorful, if not more so, and have a more appealing texture. Never buy plants that have the bulb, or eat at restaurants that feature the whole plant. Try to encourage others not to dig up or use the whole plant. (I pulled one here by accident, but it helps with identification purposes). Never take more than one leaf from the plant. Only harvest from large, well-established flushes (patches) of plants, and never take from more than 25% of the plants. The flowers and “mini bulbs” that form from them are also edible, but I would advise against it, again, for perpetuation of the species. Many experienced foragers will say things like “only take 25%/15%/ etc.” but the fact remains, there is no science behind these statements. The only scientific study I have found indicates that if you take 25% of the population, it takes 20 years to recover. Essentially, harvesting any bulbs is unsustainable practice. Source: Smokey Mountain Sightline (abstract & summary) Complete Scientific Study Here. A British study, conducted in Quebec, confirms these findings Abstract here, as does a St. Lawrence University Study, and scientists and professors interviewed by NPR. “But Native Americans ate these for centuries!” people say. And that is true, but they only used trimmings from the leaves. (New York Times). Ramp seeds can take 18 months to germinate. (US Department of Agriculture). Once the seed germinates, the plant can take 5 years to reach reproductive maturity. Source: St. Lawrence University study. So for every bulb you take, it can take up to 7 years to be replaced. Even when the plants are mature, they generally only reproduce every other year (Same US Dept. of Agriculture link), and most of the seeds they release will never germinate. Ramps have 2-3 broad, smooth, richly-green leaves. The “stems” of the leaves are often burgundy colored, and the bulbs are white and look like onions. 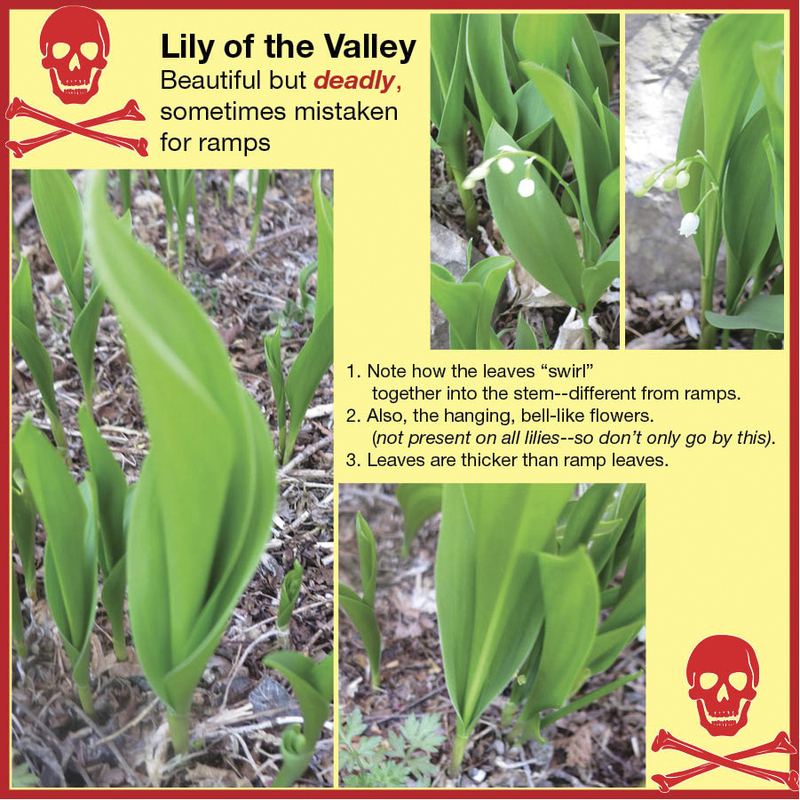 Ramps do have one deadly poisonous look-a-like: Lily-of-the-Valley. This isn’t very surprising, as onions are part of the lily family. Once blooming, Lily-of-the-Valley has small, white or rose, bell-shaped flowers which dangle from along the length of a short (leaf-height) stalk. The flowers of the Ramp are small white clusters at the end of tall stalks. Before either blossoms, the leaves look nearly identical, though the way Lily-of-leaves merge together is a little different. The test is simple: break off a leaf and take a whiff! 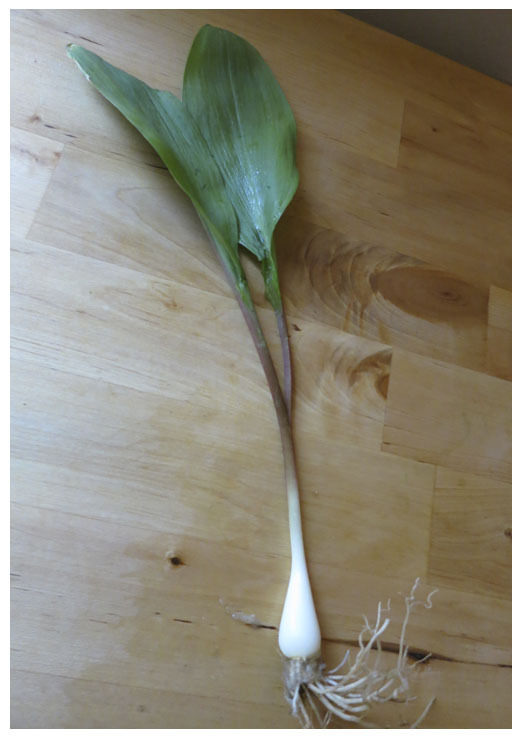 Ramps smell very strongly of onion and garlic, and Lily-of-the-Valley does not. It is important that you do NOT have garlic mustard or field garlic on your hands when you test for ramps, otherwise you could think you smell onion from the plant, when it is just your hands. Lily-of-the-Valley also have thicker leaves, with an almost rubbery feel. Ramp leaves are thin and papery, almost translucent when held up to the light. Special note: ramps only grow in the eastern half of the United States, and parts of the mid-west. Take a look at this map from the USDA. If you find something you think is a ramp outside of this range, it probably isn’t. I find ramp leaves keep well in water inside the fridge. They will stay un-wilted for a week, but they loose their flavor after 3-4 days, so don’t harvest more than you intend to use during that time. For long-term storage, rinse ramp leaves, and dry completely. Though they can be frozen in freezer bags, I find them less flavorful and with a some what mushy texture when used this way. Ramps may just be one thing best enjoyed in season. Another way to preserve the flavor of ramps is to make ramp butter, I will make a post about that later. I wanted to give the writer of this article credit, but could not find his name attached to his blog anywhere. Let’s Get This Garden Started! Do you like wine? Get my WINE 101 Class For FREE!